NASA’s Kepler mission has confirmed the first near-Earth-size planet in the “habitable zone” around a sun-like star. This discovery and the introduction of 11 other new small habitable zone candidate planets mark another milestone in the journey to finding another “Earth”, NASA said on July 23 2015. The newly discovered Kepler-452b is the smallest planet to date discovered orbiting in the habitable zone – the area around a star where liquid water could pool on the surface of an orbiting planet — of a G2-type star, like our sun. The confirmation of Kepler-452b brings the total number of confirmed planets to 1030, NASA said. “On the 20th anniversary year of the discovery that proved other suns host planets, the Kepler exoplanet explorer has discovered a planet and star which most closely resemble the Earth and our Sun,” said John Grunsfeld, associate administrator of NASA’s Science Mission Directorate at the agency’s headquarters in Washington. “This exciting result brings us one step closer to finding an Earth 2.0,” Grunsfeld said. Kepler-452b is 60 per cent larger in diametre than Earth and is considered a super-Earth-size planet. While its mass and composition are not yet determined, previous research suggests that planets the size of Kepler-452b have a good chance of being rocky. While Kepler-452b is larger than Earth, its 385-day orbit is only five per cent longer. The planet is five per cent farther from its parent star Kepler-452 than Earth is from the Sun. 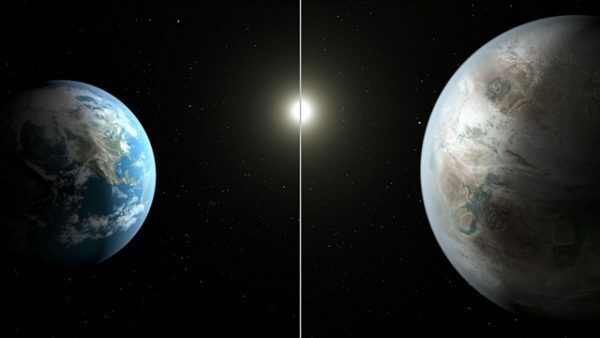 Kepler-452 is six billion years old, 1.5 billion years older than our sun, has the same temperature, and is 20 per cent brighter and has a diametre 10 per cent larger. 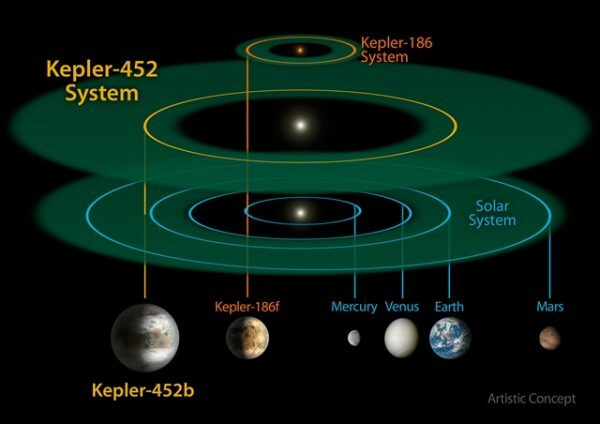 “We can think of Kepler-452b as an older, bigger cousin to Earth, providing an opportunity to understand and reflect upon Earth’s evolving environment,” said Jon Jenkins, Kepler data analysis lead at NASA’s Ames Research Center in Moffett Field, California, who led the team that discovered Kepler-452b. The Kepler-452 system is 1400 light-years away in the constellation Cygnus. In addition to confirming Kepler-452b, the Kepler team has increased the number of new exoplanet candidates by 521 from their analysis of observations conducted from May 2009 to May 2013, raising the number of planet candidates detected by the Kepler mission to 4696. Candidates require follow-up observations and analysis to verify they are actual planets. These findings, presented in the seventh Kepler Candidate Catalogue, will be submitted for publication in the Astrophysical Journal. These findings are derived from data publicly available on the NASA Exoplanet Archive. Scientists now are producing the last catalogue based on the original Kepler mission’s four-year data set. The final analysis will be conducted using sophisticated software that is increasingly sensitive to the tiny telltale signatures of Earth-size planets.